The initial concept of Craftsman Finishes was to showcase Jeremy’s work and teach people how to do the most amazing finishes he applies in the field at home. My friends and family come over to our home for dinner and want a quick tutorial and to see some of Jeremy’s latest projects. The idea was to share that nationwide. We are ready to give away his trade secrets and simplify his advanced techniques and share them with you through detailed demonstrations and tutorials. As Jeremy became more interested in the idea of sharing his work, he began thinking that the time is now to really formalize a natural paint concept to offer his readers. He has been working on the concept of how to get his finishes using the most natural products without sacrificing performance. He has worked with every product on the market and he knows the ingredients and how each one reacts in his finishing techniques. Due to it’s ancient richness and overall organic look he found that lime paint was the perfect place to start as a natural favorite product. Lime paints and plasters absorb internal air and C02 and remove toxins by releasing oxygen into the air thus producing a better indoor air quality. Lime paint has to be creamy like traditional paint and bind to all surfaces without using a synthetic bond agent. Our lime paint selections have a Lime UnderCoat product (primer) that is natural. This is a great option to acrylic and chemical paint. As you view Jeremy’s work in the Gallery you will see he uses lime based plasters and lime paint often to achieve the motteling that he desires for depth and character. 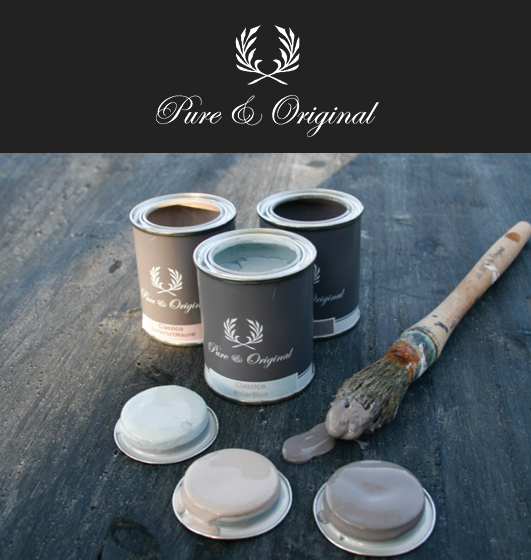 We recommend you try Pure & Original Fresco Lime Paint or Sydney Harbor Inferno Lime Wash. They are creamy lime paints that can be applied to many surfaces including walls, furniture and wood projects such as wood photo frames, moulding and base boards. Click on the image below to try Pure & Original.